No one makes fried chicken likes KFC. They have been known for their famous recipe of 11 herbs and spices for a very long time now. You can recreate their fried chicken at home. This recipe used to call for Fines herbs, but most people have difficulty in obtaining them. See www.penzeys.com for the spice. They advertising using 11 herbs and spices, we use seasoned salt to account for many of those spices. Seasoned salt is a blend of spices and salt that adds a lot of kick to any dish. KFC Fried chicken is known all the world around. Yes, you can go to pick some up anytime you like at your local KFC. Maybe you live away from one and you can recreate your own with this CopyKat Recipe. Recreate KFC Fried Chicken at home with this copycat recipe. Cover chicken with a mixture of water and salt. Chill in bowl for least 1 hour. Combine herbs, onion powder, seasoned salt, instant chicken broth, and pepper in a blender and mix well. Place this mixture in a bowl. Add the flour to this bowl. Mix flour and seasonings well. Remove chicken from water, and dip it into the flour mixture coat well. Place coated pieces on a plate for 5 minutes. Melt enough shortening or salad oil to make 1-inch depth in a large skillet. Heat to 375 degrees. Fry chicken pieces turning once, every 5 minutes, be sure to cook chicken until done. Lift chicken out and drain on paper towels. You can keep the chicken warm in the oven by placing it in the oven, and serve when all pieces are finished cooking. MSG stands for Monosodium Glutamate. It is a spice, found in your grocery store. It can be sold as MSG or under the brand name "Accent". Some people are extremely allergic to MSG, over 98% of the population is not. It serves to make flavors stronger, and almost pop right out at you. Fines herbs used to be used more frequently many years ago. Fines herbs was a poultry seasoning. Since so many people have difficultly in obtaining the herb. Thank for your post! It is easy to understand, detailed and meticulous! I have read many other articles about the same topic, but your article convinced me! I hope you continue to have high quality articles like this to share with veryone! Very good recipes. To make it even better, soak the chicken for 12 hours in egg and buttermilk. The acid in the buttermilk tenderizes the chicken and gives a better flavor. southern ladies have done this for years. use peanut or coconut oil to cook in. all other oils are not good for you. the others burn at higher heat and releases cancer chemicals. Thank you for your suggestions. I agree marinating chicken always makes it better. Thank you again! I moved from the states to Xi’an, China. Yes we have KFC here, but like most other American fast food restaurants here, the recipes are altered. The chicken here has different seasoning. So, yes it may be recognized world-wide, but it is not the same product. So WHAT IS THE “fine herbs” in this recipe?? 1. Mix together all of ingredients & store in tightly sealed glass container. Gary Moore: using a salt brine to the soak also helps really plump up the chicken meat. Who would have thought that “bro science” at the gym would ever come in handy: excess sodium makes you….retain water, duh! Haha! I need to make this for my family! They will go crazy for this! Oh thanks for sharing – I do love some KFC style chicken! I think for people who can’t find Fines herbs, or don’t like MSG or want it to be as close to the Colonels, I would read what SNUGSCAT wrote. She has first hand experience. KFC does NOT use soy sauce, and DOES use a pressure cooker. Always have. If you want the real 11 herbs and spices, see her list. Play with it to find the correct amounts. Can’t believe KFC hasn’t taken MSG off their ingredients list yet but not sure I’d want them to change things either. They are so good and am so thankful for your recipe! This sounds amazing! Certainly cheaper than ordering the real thing 🙂 I will definitely be trying this in the very near future. And I’m drooling! 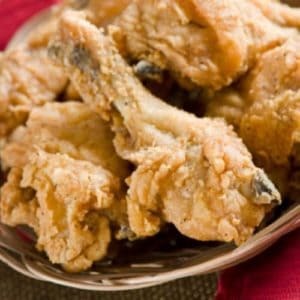 Fried chicken is my very favorite comfort food! Seems like a lot of work! lol Looks good though! I will have to try out this recipe. I love KFC’s chicken! What an awesome way to cook up chicken! I’m definitely going to have to try those spices. I would love to try this! I’m a big fan of KFC fried chicken. I love KFC fried chicken. I haven’t been able to eat it for a long while because of my gallbladder and boy oh boy do I miss it. This looks so good! I will have to try it! I love KFC chicken. Your recipe sounds finger lickin’ good!